Delhi, the capital city of India, is an overwhelming and chaotic city. It’s the City of Djinns and 25 million people. It’s dirty, it’s exhausting and it’s full of people that seem to want something from you. But, it’s also a city with history, incredible sights and hidden gems. In this post you can find 20 fun things to do in Delhi, a hotel recommendation and restaurant recommendations. It can make you mad, walking around in Delhi. A lot of people seem to want something from you. However, try to put this aside and just smile and keep walking. I noticed that there is really so much going on in the streets. So, if you are just aware by how crazy this city is, and just walk around to observe it, it’s quite entertaining. 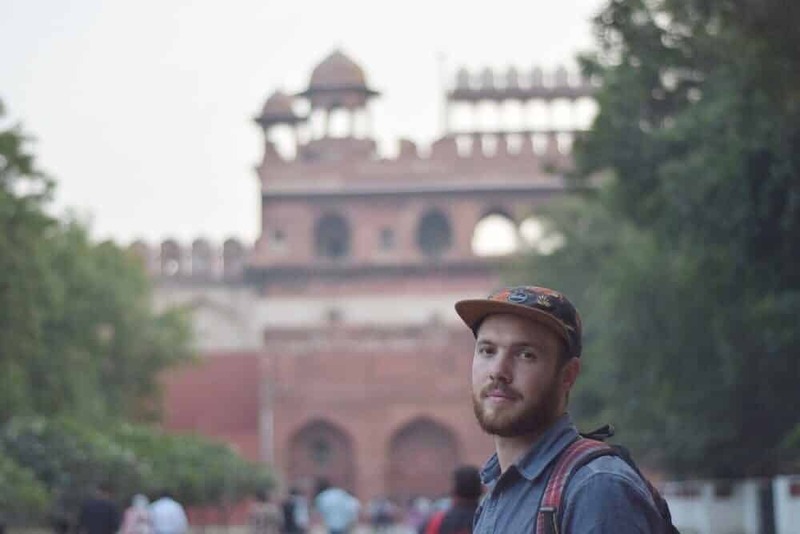 The second time we arrived in Delhi, I suddenly realized how much was actually going on. Jeffrey pointed out that there was a dog chasing a monkey. I saw how another dog was pooping in the middle of the street. Monkeys on the roof, people having arguments, people burning trash, dogs fighting, dogs playing, two people walking handing hand, people screaming… It never stops! Just walk around, or maybe go in a rickshaw, and enjoy the chaos. 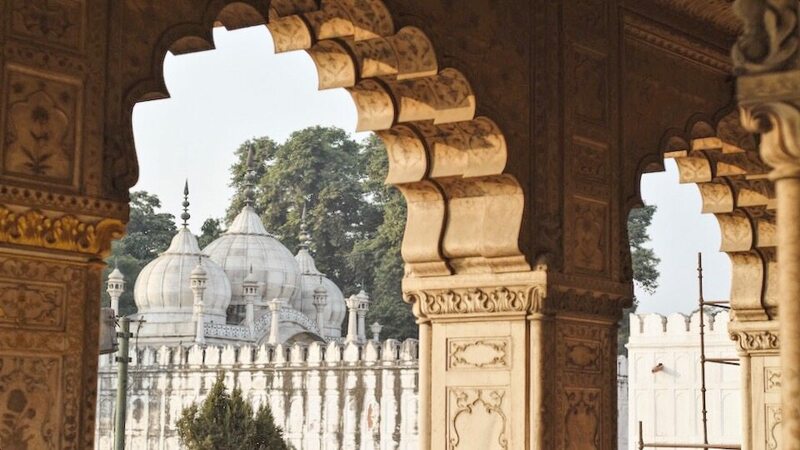 If you’re interested in learning more about the Indian heritage, we recommend to go on a tour and walk through the streets and bazaars of Old Delhi. 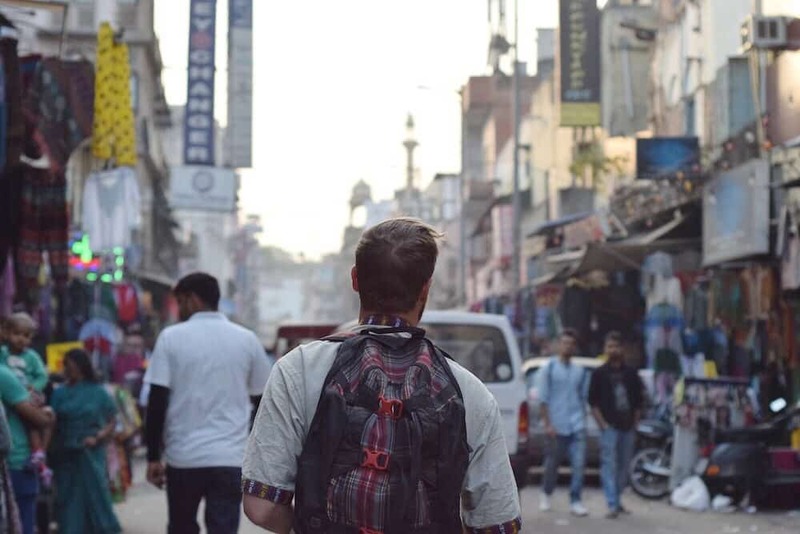 With the Old Delhi Heritage Walk by Get Your Guide you experience the traditional Indian lifestyle and you get to visit the Heritage Building and the Jain temple. Together with a local guide you travel to the Spice Market on a rickshaw and learn about the medical and health benefits of Indian spices, herbs and teas. The Lotus Temple is one of the better known temples in Delhi. The structure is made of pure white marble and resembles a lotus flower. It’s the Bahá’í House of Worship and stands for peace, purity, love and immortality. The Lotus Temple is one of the most popular attractions in Delhi and attracts 10.000 visitors each day. We love Indian food! If you do too, we recommend to take a food tour. With the food tour by Get Your Guide you walk with a personal guide and learn everything about Old Delhi’s chaotic street food culture. Try out the best kebabs in old time restaurants, delicious Mughlai cuisine and visit the world’s largest spice market. Swaminarayan Akshardham in New Delhi is a Hindu house of worship, where spiritual, devotion, learning and culture all come together in harmony. Akshardham means the divine abode of God. It’s an eternal place of peace and purity. All this can be found in the beautiful architecture of this temple. This is arguably the most beautiful temple we have ever seen in our lives. I think I’ve never felt the power of a place so much before, it had such a magical vibe. Unfortunately, in this temple you aren’t allowed to take photos. But this does add to how special this place is. You really have to go there and see it for yourself. Of course, it’s nice to know beforehand that you aren’t allowed to take photos. Then, you already know that you don’t have to bring your camera. Luckily there are lockers, but it’s on your own risk to leave it there. You aren’t allowed to take a bag inside, you have to put this in your locker too. Exhibitions are held on Hinduism. The 800 year old Gauri Shankar Temple is a Hindu temple located near the Digambar Jain Lal Mandir on the main Old Delhi road in Chandni Chowk. The temple is dedicated to Lord Shiva and is considered to be one of the most significant temples of Shaivites. 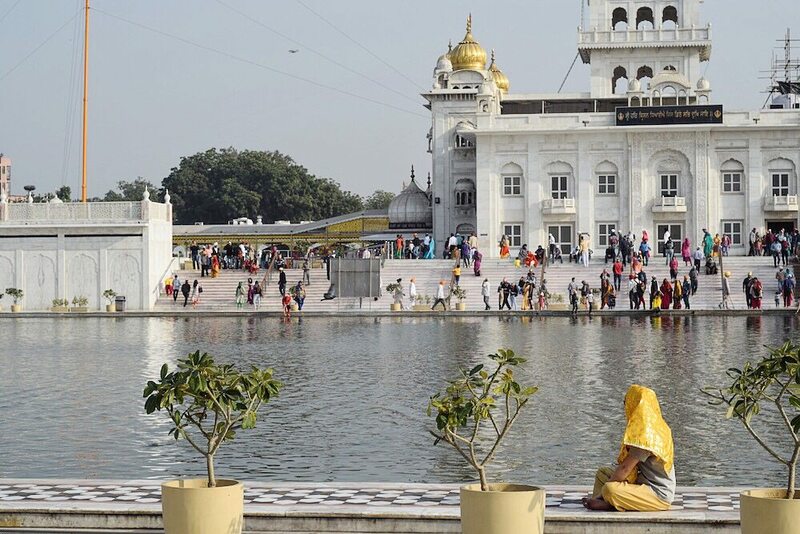 This temple is created into a center of pilgrimage for thousands of people every day. It is said that the water, brought by Raja Jai Singh, is taken to cure ailments. In this temple one can also find a hospital, a girls school and an art gallery. When we were there, it wasn’t so busy. This was probably because a large part of the temple was in construction. That also made it seem less impressive to us. However, it’s definitely worth seeing when it’s completely renovated again. Also, there is no entrance fee, making it accessible to anyone. Jhandewalan Hanuman Mandir is one of the most popular Hindu temples in Delhi. This temple is hard to miss as it shows a huge statue of Lord Hanuman. Once you go inside of the temple, you have to go through the mouth of what looks like a monster. It can be a reference to the story of one of the monsters that were vanquished by Lord Hanuman. Another impressive temple is the Chhatarpur Mandir temple. This beautiful monument was built in both the South and North Indian style of architecture. In the temple you will find numerous shrines, dedicated to Lord Shiva, Lord Vishnu, Goddess Laksshmi and Lord Ganesha. Shri Digambar Jain Lal Mandir is the oldest and best-known Jain temple in Delhi. It’s possible to combine it with a visit the Red Fort, as it’s directly across from it in the historical Chandni Chowk area. It’s a beautiful red sandstone temple and is known as Lal Mandir (or “Red Temple”). 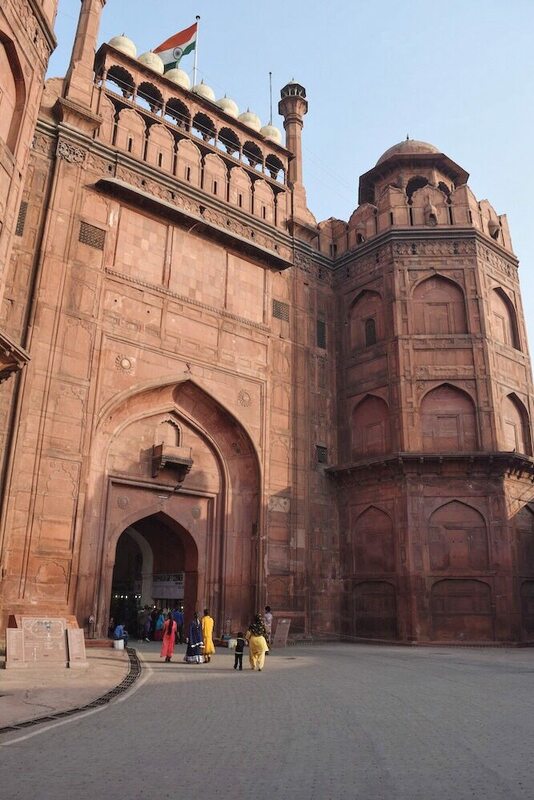 The Red Fort was constructed under order by the Mughal ruler Shah Jahan, when he moved from Agra to Delhi. It was build in the north-eastern side of the newly founded city Shahjahanabad, which is now known as Old Delhi. The name of the fort comes from the red colored sandstone. The fort is really large and certainly is very impressive! We found the Red Fort very beautiful and interesting to see. It was a bit expensive for foreigners (500 rupees), while for Indian people and visitors of SAARC, it’s very cheap (30 rupees). This is the case with most entree fees in India. At first we were doubting to go in, but we are happy we did. Inside you can find many gorgeous buildings with incredible details and lots of usage of beautiful marble. Examples are the Diwan-i-Am (“Hall of Public Audience”), Rang-Mahal (“Painted Palace”), Diwan-i-Khass (‘Hall of Private Audience’) and Tasbih-Khana (‘chamber for counting beads for private prayers’). 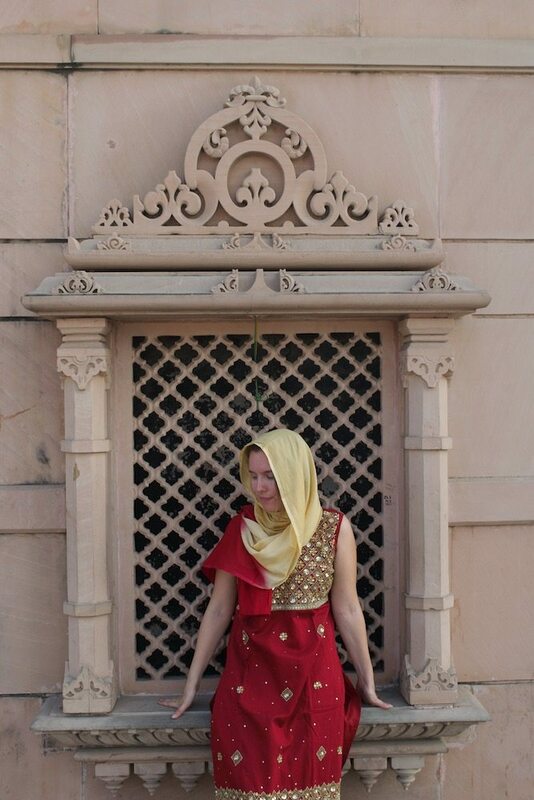 Traditional Indian clothing is beautiful, with gorgeous details and colourful fabrics. Therefore it’s a great idea to buy traditional clothing in Delhi. Personally, I felt very comfortable by walking around in traditional Indian clothing, as it showed that I respected the local culture. Be sure to check out this article for some great markets in Delhi, where you can buy traditional clothing and other items. It’s possible to visit the residence of the former Prime Minister of India, which is now the Indira Gandhi Memorial Museum. Here it’s possible to see the collection of rare photographs of the Nationalist movement, the personal moments of the Nehru-Gandhi family and her childhood. Furthermore, there are also other personal displays and it’s even possible to see the bloodstained sari she was wearing when she was assassinated in 1984. The Indian Habitat Center has a Visual Arts Gallery, which is a hub for art activity of different genres. Here you can enjoy various exhibitions and different artworks. Furthermore, the Indian Habitat Center also has a library and resource center, a learning center and interesting workshops. Learn more about the Indian Habitat Center here. If you love art, it’s also an idea to visit the National Gallery of Modern Art. At this gallery you can find artwork from the 1850s and onwards. You can follow a guided walk every day, which is free of charge. The Change of Guards ceremony is a military tradition in Delhi. At Rashtrapati Bhavan the guards are changed periodically so the President of India has new troops. In recent years, the ceremony has been relocated and made more visually appealing and friendlier to the public. The Change of Guard Ceremony is held every Saturday for the public. To watch the ceremony you need a valid photo ID. Book lovers can visit the Delhi Public Library. They have a wide range of books, journals and other reading materials in Hindi, English, Urdu, Punjabi and other Indian languages. During your time in India you should definitely visit the Taj Mahal. Read our post about a day trip to the Taj Mahal if you want to visit the Taj Mahal without a tour. If you want to visit the Taj Mahal on a day trip from Delhi, we definitely recommend to go on a tour so it all goes smoothly. For instance the Taj Mahal and Agra tour from Delhi by Express Train. Do you want to learn more about the Indian legend Mahatma Gandhi and his rol in India’s independence? With the Gandhi’s Journey Day Tour you can visit the National Gandhi Museum and Birla House where Gandhi spent his last 144 days and was shot down. Besides being the city’s key financial and business center, Connaught Place is also filled with cultural spots, cinemas, art galleries, restaurants and bars. It’s a great place to grab a drink or have a night out. Check out 10 cool bars in Connaught Place. Like we said at the start of this article, Delhi is a tiring place and can be quite overwhelming. In chaotic places like Delhi, it’s important to stay at an accommodation where you can really find rest. Friends of us recommended Smyle Inn to us and we weren’t disappointed. It’s a great budget hostel located in the heart of Delhi. It has actually been voted Best Hostel in India by Hostelworld! The room was basic and comfortable, with private bathroom, hot shower and good wifi. They also have computers you can use, and there is a travel desk that can help you plan your trip. We used the travel desk to organize our train tickets to our next destination. We stayed at their hostel both times we were in Delhi, because we were really satisfied. When we arrived in Delhi and came to Smyle Inn for the first time, we got the Superior Room. What we noticed most here is that we heard no noise from outside whatsoever. The second time we stayed at Smyle Inn was the night before we left India. This time we booked the Standard Room. Other than being a bit smaller, we felt that this room was as comfortable as the Superior Room. This time we thought we might hear more from the noise outside, but only heard a dog bark close to our window once. Praying for good Indian food. Honestly, we didn’t find that many great places to eat in Delhi. As we just came from Nepal where we loved the food, we were quite unimpressed. There we found countless amazing hip restaurants in cities such as Kathmandu and Pokhara. However, both Jeffrey and I are a huge fan of Indian food, and we did find some restaurants with delicious meals. Also, most restaurants in Delhi are really cheap! However, they do often put an extra 10% tax on it, without stating it on the menu, which honestly is annoying: we love transparency. This was located close to our hostel. We just arrived in Delhi and were walking around, searching for a good place to have some lunch. Unfortunately, we barely saw anything, but this place seemed okay. So we went in and had our first meal in India here (apart from the street food we had on the way during the bus ride). The interior is a bit tacky, but we sat comfortable and the food was quite tasty. We came back to this place on our last night in India. Jeffrey had a burger and I had falafel. It was around 600 rupees in total. We met a lovely British couple on our second day in Delhi and we decided to have dinner together. They had read positive stories about Tadka online, so we went there. The restaurant was clean, had a wide range of Indian dishes and the food we had was very, very tasty. We both had a Indian curry, Palak Paneer and Paneer Butter Masala, and shared naan and plain rice. It was more than enough. The interior wasn’t special at all, but I guess the food made it all worth it. We payed around 300 rupees per person, drinks included. We had breakfast here, as it was right opposite to our hotel. It was a nice small place. The menu wasn’t very extensive, but enough choices to keep you there. We both had sandwiches and smoothies, which were tasty and cheap! We feel like we haven’t visited the best places to eat in Delhi. So we did some research and found this list with the Best Romantic Restaurants in Delhi for some inspiration for your next visit! 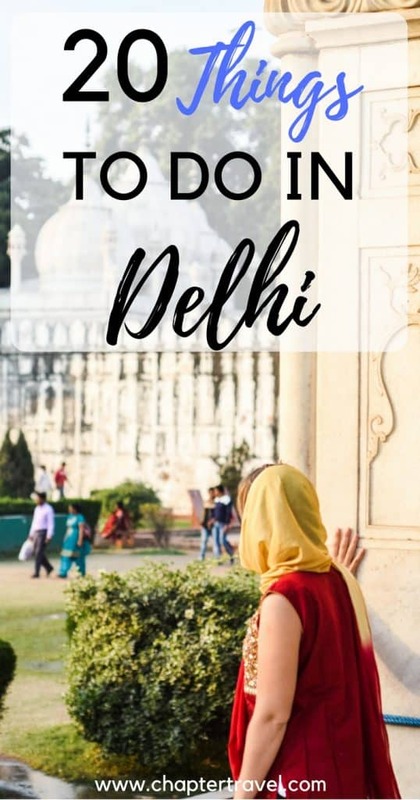 Have you ever been to Delhi in India? How was your experience? I visited Delhi last year and it was such an amazing experience. My absolute fave thing to do was to simply walk the streets and connect with the locals.. It’s a crazy place! Thanks Marije! Ben super blij met jullie aanbeveling, we hebben het fijn gehad bij Smyle Inn!